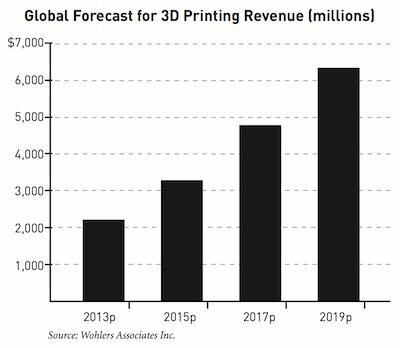 3D printing is one of the “prominent technology trends expected to influence the consumer electronics industry in the years ahead,” according to the 2013 edition of “Five Technology Trends to Watch” report by the Consumer Electronics Association (CEA) released this eariler this week. Rounding out the five technology trends were technology in education, the evolution of audio, next-generation TV and displays, and the mobile revolution in Africa. The report provides an in-depth analysis of each of the trending technologies, including market forecasts, consumer perspectives, key players and partnerships. In addition, the analysts look back over the previous 12 years of forecasts they have made. The four page section of the report devoted to 3D printing, called 3D Printing Arrives Layer by Layer (page 5), was written by Mark Chrisholm. He does a great job at laying out the technology’s foundation and history, the multiple applications using 3D printers, the consumer effect, industry forecasts and 3D printing’s disruptive future. This is probably as good of an overview you can find on the past, present and future of 3D printing. It’s a good read for not only yourself, but to pass along to friends and associates who think you may be overestimating the future of additive manufacturing. Download the full 24-page report here.